David qualified from Cambridge University in 1997 and began in practice in Upminster, Essex soon afterwards. 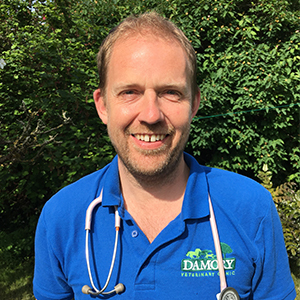 He decided that he would concentrate solely on small animal practice and soon afterwards began studying towards a Royal College Certificate in Veterinary Radiology. He was awarded the Certificate in 2002 shortly before arriving at the Damory Veterinary Clinic in 2003. Since being at Damory, David's main areas of interest have been diagnostic imaging and internal medicine. However he also completed a second certificate in small animal ophthalmology in June 2016. David is married with 3 children who occupy most of his time outside work. However, when time allows, he is also a keen cricketer and can regularly be seen donning his whites for the Blandford Flies.